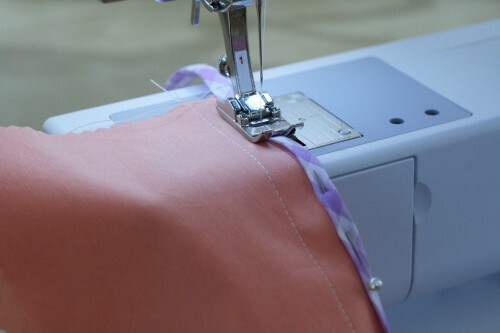 Bias bound seams are a simple way to finish your garment. You can easily make the insides as interesting as the outsides by using patterned bias binding or play it down with matching colors. Either way, this is a nice finish and easily customizable. 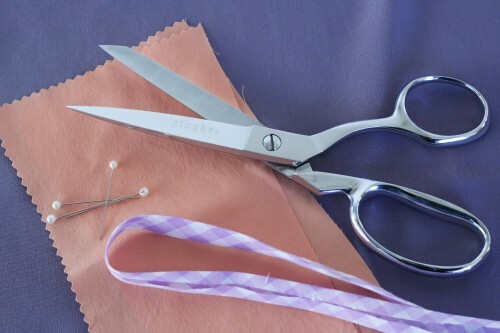 Keep in mind that the binding will add a some bulk to your garment and plan accordingly. 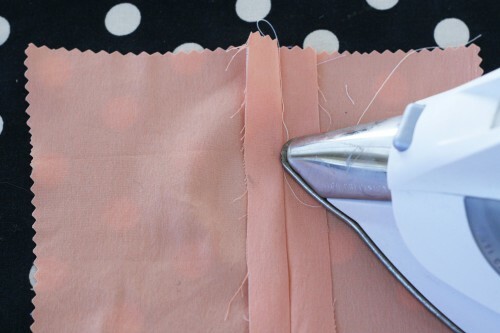 Today, we’ll show you two ways to finish your seams with bias tape. Version 1 binds the seam allowances together, while version 2 binds them separately so the seam can be pressed open. 1. Stitch the seams together as usual. 2. Pin the bias binding to the closed seam. 3. Sew the bias binding. 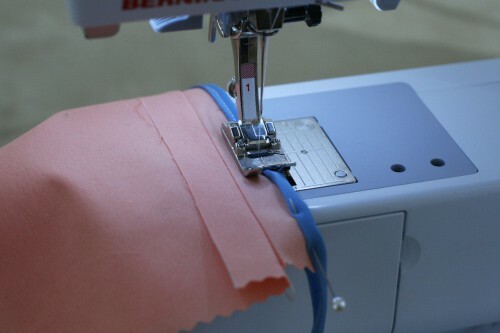 Make sure that the back of the bias tape is being sewn down as you go. Once the seam is finished, press it to one side and you’re done! Here is another bound seam, this time pressed open. Usually this finish is found in jackets or garments made with thicker fabrics such as cotton twill, certain wools or other medium to heavy weight fabrics. 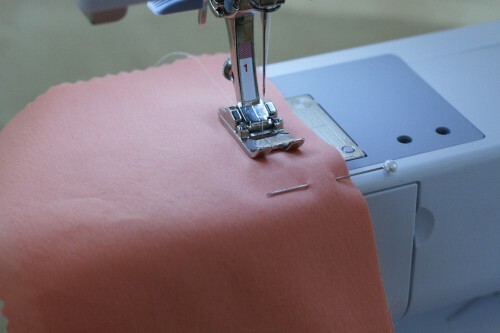 Whatever the garment, the seams must lie flat so make a test seam if you’re using a thick fabric. This seam is fairly easy to make but takes a little more time than version 1, since both sides of the seam allowance are bound. 1. Sew the seam as you would normally. 3. 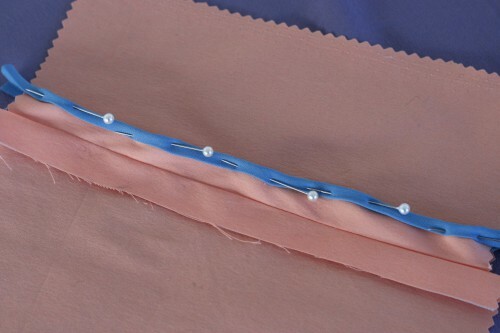 Pin a strip of bias binding to one of the seam allowances. 4. Sew the bias binding, being sure the binding is sewn on the back side. 5. Follow steps 3 and 4 for the opposite seam allowance. 6. Press the seam open. 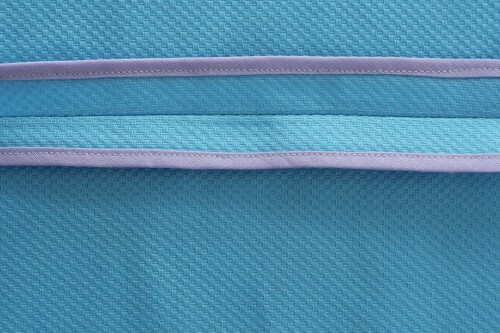 The seam will remain open on the inside of the garment. Play around with different bias bindings. Make your own using this easy bias tape tutorial Sarai put together! I like to use a binding foot to make hong kong seams. It’s such a great finish, especially for unlined jackets and for trousers. Thanks for this great tutorial, I’ve been wanting to do this for ages. Was wondering though about say if I did side seams like this, then when I add the sleeves will it add a lot of extra bulk? It does add extra bulk, so it’s best for a sturdy fabric that won’t show the bulk so much. It’s most often seen on jackets, trousers, or skirts with some stiffness, I’d say. I have been thinking about finishing my seams this way for a while on a new dress I am working on. I have seen organza used to bind seams, which would take care of the bulk issue, but working with a slippery little piece of organza seems like a pain. I think the main thing I wonder about is the process seams merging that have been bound. Do you make sure that they were pressed to all meet at the same spot, wouldn’t that mean that the ends of pieces would be semi unfinished? I dont know if that makes sense, its early. haha. 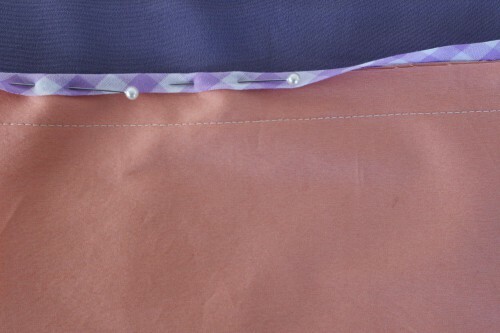 You can also do Hong Kong seams, which is basically binding each seam allowance edge separately instead of together. Not sure if that would help with the problem you’re thinking of? sigh, im sorry. I think I was talking about intersecting seams using this finish and how to do so neatly without having raw ends… but now in my head, I think I can think of a solution. Thanks for the reply! I love the idea of using a contrasting binding. What a fun surprise to have inside of your garment! Since i started sewing, I have come to know different ways to finish the seam/edge. Having applied some myself, I started questioning whether I am using the right technique at the right section. for example, for the body and skirt of rooibos, I used french seam which totally add bulk to my garment and made it very hard to sew through the multiple layers. I should have used bias bound seams to finish it off. It will be great if you can cover the different type of finishing and where’re best to apply them in future posts. Thanks for the tutorial. We’re planning a post just like this! Great news about the upcoming post. I am a big fan of french seams & use them exclusively on ALL of my projects. However, I have a difficult time with arm hole seams. Is there a trick for using french seams on arm holes (curved seams) or should I be using something else: Hong Kong, bias bound, flat felt, etc.? I get perplexed with the clipping. Do I clip for ease before I sew the encasing seam? To me, it wouldn’t make sense to do it after. Yes you can French your sleeve seams. I find it easier to first trim it with a pair of pinking shears (it acts as the clipping/notching for the convex & concave curves). Then trim it down some more with your regular pair of shears. This way you solve the problem of clipping the beautifully finished seam on the wrong side of your garment. Hope it makes sense. Hi, I just started reading your blog… it is so helpful! 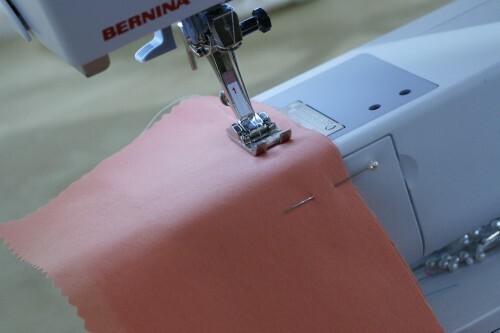 I am getting a new sewing machine this week and can’t wait to start sewing again, it’s been many many years! Thank you for your wonderful tutorials with photos!!! Biais bound seams are a really great way to finish a garment, especially when contrasting. I’m addicted to Liberty of London biais, because it’s so soft and agreeable to sew. I envision so many projects with this very detail that it migh become a signature! 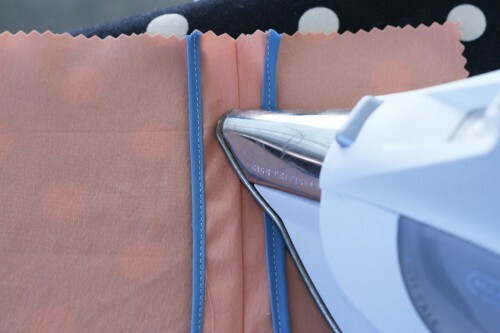 Have you tried and do you recommend snug hug seam binding? Or is that too advance for beginners?